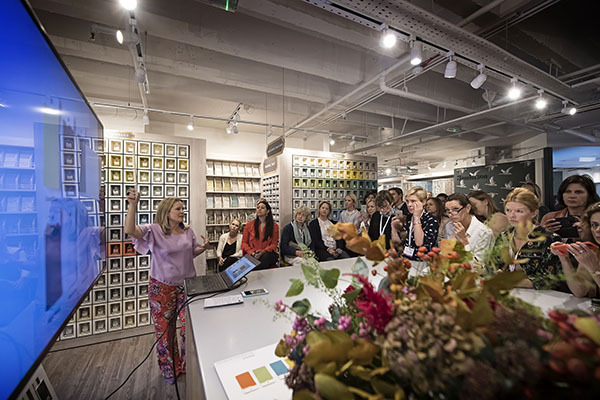 “I can’t think of a better place to come and see the hues, fabrics and pigments that are exciting people at the moment,” says the author and colour expert about Design Centre, Chelsea Harbour. “The happiest times of my life are associated with beautiful, familiar things and family,” said grande dame US decorator Sister Parish. Her signature style made her a favourite among some of the best-known names in America: Astors, Gettys, Rockefellers and Vanderbilts were among her clients, and she also worked on redecorating the White House during the presidency of the Kennedys. Her legend lives on via a fabric, wallpaper and accessories company run by three further generations of her family. 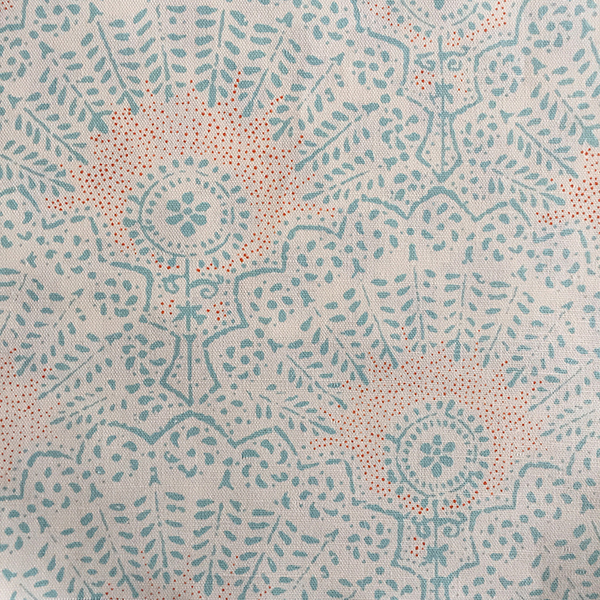 This hand silk-screened ‘Appleton’ print in robin’s egg blue and paprika is a new arrival at Tissus d’Hélène. 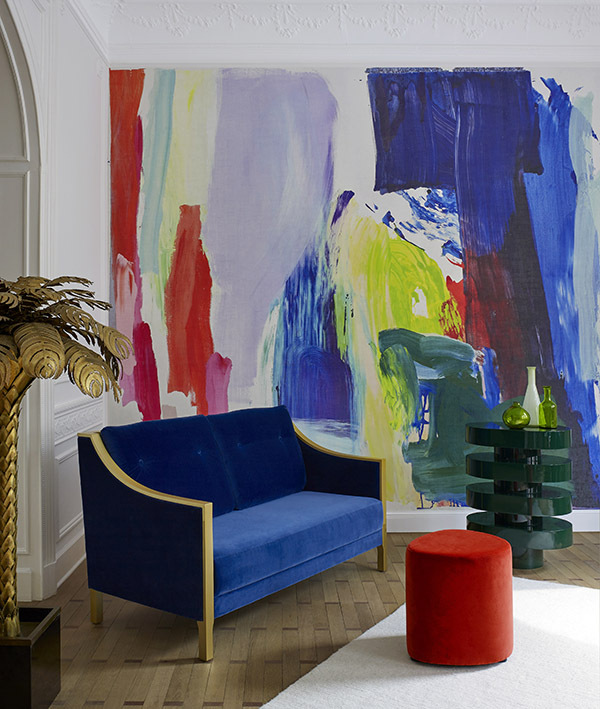 Pierre Frey’s Galerie collection focuses on panoramic wallpapers, their larger format allowing for some highly statement-making walls that act as a window on to another world. Stylistically they are incredibly diverse, with the common thread of artistic expression – there are bold contemporary paint splashes in ‘Karma’ (pictured), Rococo exuberance in a reproduction of a Boucher painting from 1758, and trompe-l’oeil blue and white tiles in the manner of a traditional Portuguese interior. Focus/18’s Colour Workshops, a new initiative for the show, aim to expand upon the show’s broader theme of colour – beyond its use in design, to its importance in psychology, history, fashion, food and healing. Together, they build up a rounded picture of how colour is an essential influence in every facet of our lives. 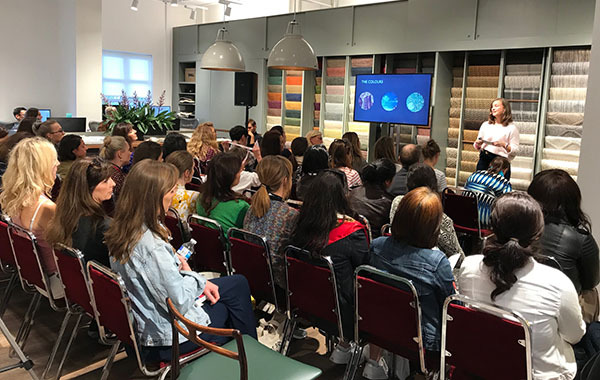 Interior design and broadcaster Sophie Robinson visited Style Library to explain how colour psychology informs her work, and demonstrate some harmonious palettes that support various personality types. Author Kassia St Clair (pictured bottom in the Tim Page Carpets showroom) put the subject into an historical and cultural context, weaving fascinating stories about individual colours – some of them with unusual connotations, such as the vivid but deadly arsenic green used in Victorian wallpaper. The crossover influences between fashion and interiors were explored by jeweller Sabine Getty, in conversation with Tatler‘s Olivia Bennett, while author and energy healer Georgia Coleridge brought a holistic approach to colour, explaining how it can heal and energise. The importance of colour in food and drink came under the spotlight, too, as Cawston Press’s head of taste Micah Carr-Hill talked through how to make the perfect colourful cocktail. “I’ve built up some really lovely relationships with the people here,” says the interior designer about Design Centre, Chelsea Harbour. Black & Key has teamed up with interior surfaces specialist Kote to add a colourful new finish to its portfolio. The Mineral Micro Mortar coating is cement-based and comes in 64 colours (using natural pigments), resulting in beautifully subtle colour variation. 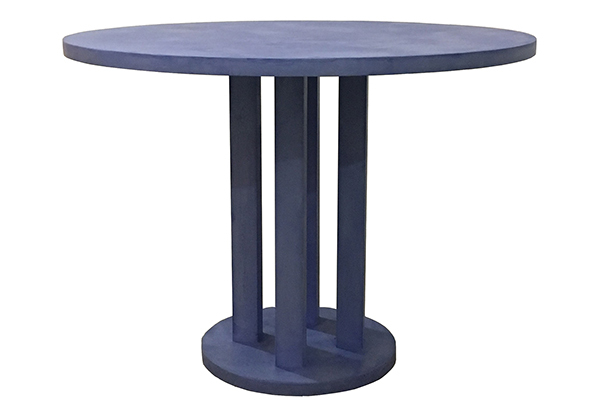 Pictured is Black & Key’s new ‘Vesta’ table in Ultra Marine Mid; the resilient, washable and smooth surface can also be adapted for outdoor use.